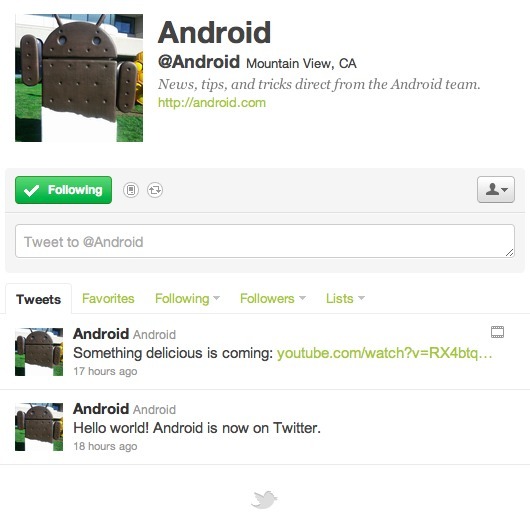 It is official, the Android Team has joined twitter. If you are an avid tweeter and looking for the latest and greatest Android news as it breaks, there are now three accounts that you should follow: @Android, @AndroidDev and of course @Droid_Life. As of this morning the only tweets were the two you see above. A short” Hello world!”, and a video featuring the unpacking of the Ice Cream Sandwich statue. The account sports an avatar of our robot friend in a delicious form. Galaxy Nexus Also Shows Up in Best Buy Cellebrite System, Will It Be Their Exclusive? Google Plans On Opening MP3 Store In The Coming Weeks?